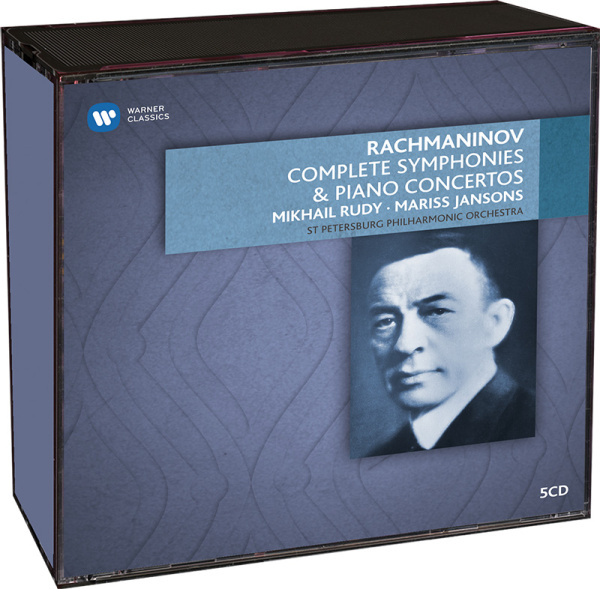 Die Sammlung mit dem St. Petersburger Philharmonic Orchestra, dem Pianisten Mikhail Rudy und Mariss Jansons gilt als exemplarisch, trifft sie doch den Ton des Meisters, der auch Pianist und Dirigent war, wie kaum eine andere. 1 Rudy,Mikhail/Jansons,Mariss/SPP 1. Vivace - 13:04 Min. 2 Rudy,Mikhail/Jansons,Mariss/SPP 2. Andante - 06:54 Min. 3 Rudy,Mikhail/Jansons,Mariss/SPP 3. Allegro vivace - 08:17 Min. 4 Rudy,Mikhail/Jansons,Mariss/SPP 1. Moderato - 11:35 Min. 5 Rudy,Mikhail/Jansons,Mariss/SPP 2. Adagio sostenuto - 12:19 Min. 6 Rudy,Mikhail/Jansons,Mariss/SPP 3. Allegro scherzando - 11:42 Min. 1 Rudy,Mikhail/Jansons,Mariss/SPP 1. Allegro ma non tanto - 16:55 Min. 2 Rudy,Mikhail/Jansons,Mariss/SPP 2. Intermezzo: Adagio - 10:55 Min. 3 Rudy,Mikhail/Jansons,Mariss/SPP 3. Finale: Alla breve - 14:13 Min. 4 Rudy,Mikhail/Jansons,Mariss/SPP 1. Allegro vivace - Alla breve - 09:53 Min. 5 Rudy,Mikhail/Jansons,Mariss/SPP 2. Largo - 06:50 Min. 6 Rudy,Mikhail/Jansons,Mariss/SPP 3. Allegro vivace - 09:38 Min. 7 (keine Angaben) (keine Angaben) - 10:10 Min. 1 Rudy,Mikhail/Jansons,Mariss/SPP 1. Grave - Allegro ma non troppo - 14:06 Min. 2 Rudy,Mikhail/Jansons,Mariss/SPP 2. Allegro animato - 08:29 Min. 3 Rudy,Mikhail/Jansons,Mariss/SPP 3. Larghetto - 10:34 Min. 4 Rudy,Mikhail/Jansons,Mariss/SPP 4. Allegro con fuoco - 13:22 Min. 5 Rudy,Mikhail/Jansons,Mariss/SPP Die Toteninsel op. 29 (Sinfonische Dichtung) - 19:48 Min. 6 Rudy,Mikhail/Jansons,Mariss/SPP Scherzo d-moll (für Orchester) - 05:29 Min. 7 Rudy,Mikhail/Jansons,Mariss/SPP Nr. 14 Voaclise - 06:58 Min. 1 Rudy,Mikhail/Jansons,Mariss/SPP 1. Largo - - 04:15 Min. 2 Rudy,Mikhail/Jansons,Mariss/SPP Allegro moderato - 13:31 Min. 3 Rudy,Mikhail/Jansons,Mariss/SPP 2. Allegro molto - 09:31 Min. 4 Rudy,Mikhail/Jansons,Mariss/SPP 3. Adagio - 13:51 Min. 5 Rudy,Mikhail/Jansons,Mariss/SPP 4. Allegro vivace - 13:34 Min. 6 Rudy,Mikhail/Jansons,Mariss/SPP Introduction: Allegro vivace - 00:08 Min. 7 Rudy,Mikhail/Jansons,Mariss/SPP Variation 1: Precedente - 00:18 Min. 8 Rudy,Mikhail/Jansons,Mariss/SPP Tema: L'istesso tempo - 00:19 Min. 9 Rudy,Mikhail/Jansons,Mariss/SPP Variation 2: L'istesso tempo - 00:18 Min. 10 Rudy,Mikhail/Jansons,Mariss/SPP Variation 3: L'istesso tempo - 00:24 Min. 11 Rudy,Mikhail/Jansons,Mariss/SPP Variation 4: Più vivo - 00:29 Min. 12 Rudy,Mikhail/Jansons,Mariss/SPP Variation 5: Tempo precedente - 00:28 Min. 13 Rudy,Mikhail/Jansons,Mariss/SPP Variation 6: L'istesso tempo - 01:04 Min. 14 Rudy,Mikhail/Jansons,Mariss/SPP Variation 7: Meno mosso, a tempo moderato - 01:14 Min. 15 Rudy,Mikhail/Jansons,Mariss/SPP Variation 8: Tempo 1 - 00:35 Min. 16 Rudy,Mikhail/Jansons,Mariss/SPP Variation 9: L'istesso tempo - 00:32 Min. 17 Rudy,Mikhail/Jansons,Mariss/SPP Variation 10 - 00:53 Min. 18 Rudy,Mikhail/Jansons,Mariss/SPP Variation 11: Moderato - 01:37 Min. 19 Rudy,Mikhail/Jansons,Mariss/SPP Variation 12: Tempo di minuetto - 01:16 Min. 20 Rudy,Mikhail/Jansons,Mariss/SPP Variation 13: Allegro - 00:29 Min. 21 Rudy,Mikhail/Jansons,Mariss/SPP Variation 14: L'istesso tempo - 00:44 Min. 22 Rudy,Mikhail/Jansons,Mariss/SPP Variation 15: Più vivo - Scherzando - 01:08 Min. 23 Rudy,Mikhail/Jansons,Mariss/SPP Variation 16: Allegretto - 01:39 Min. 24 Rudy,Mikhail/Jansons,Mariss/SPP Variation 17 - 01:53 Min. 25 Rudy,Mikhail/Jansons,Mariss/SPP Variation 18: Andante cantabile - 02:55 Min. 26 Rudy,Mikhail/Jansons,Mariss/SPP Variation 19: L'istesso tempo - 00:32 Min. 27 Rudy,Mikhail/Jansons,Mariss/SPP Variation 20: Un poco più vivo - 00:37 Min. 28 Rudy,Mikhail/Jansons,Mariss/SPP Variation 21: Un poco più vivo - 00:25 Min. 29 Rudy,Mikhail/Jansons,Mariss/SPP Variation 22: Un poco più vivo - Alla breve - 01:42 Min. 30 Rudy,Mikhail/Jansons,Mariss/SPP Variation 23: L'istesso tempo - 00:50 Min. 31 Rudy,Mikhail/Jansons,Mariss/SPP Variation 24: A tempo un poco meno mosso - 01:16 Min. 1 Rudy,Mikhail/Jansons,Mariss/SPP 1. Lento - Allegro moderato - Allegro - 13:05 Min. 2 Rudy,Mikhail/Jansons,Mariss/SPP 2. Adagio ma non troppo - Allegro vivace - 12:15 Min. 3 Rudy,Mikhail/Jansons,Mariss/SPP 3. Allegro - Allegro vivace - 12:15 Min. 4 Rudy,Mikhail/Jansons,Mariss/SPP Nr. 1 Non allegro - 11:19 Min. 5 Rudy,Mikhail/Jansons,Mariss/SPP Nr. 2 Andante con moto (Tempo di valse) - 09:30 Min. 6 Rudy,Mikhail/Jansons,Mariss/SPP Nr. 3 Lento assai - Allegro vivace - 13:38 Min.